Barbarie’s has been a mainstay in the Greater Danbury area for forty years. 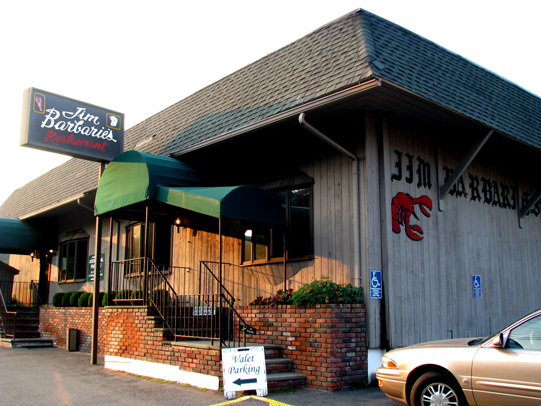 Originally owned and hosted by Jim Barbarie and known for its incredible seafood and steaks, the family run restaurant is now run and hosted by Jim’s son Tommy who has worked at the restaurant since he was a teenager. It is fair to say that Tommy has learned a thing or two over the last twenty-five years working at Barbarie’s. He is definitely a ‘character’ with a larger-than-life personality and is the perfect host; friendly, warm and funny, yet never intruding on your table or conversation, simply ensuring that every diner is well served and having a good time. The wait staff are friendly and most have been working here a long time so know the menu well; don’t hesitate to ask for recommendation or to order from the full bar. At 7PM weekdays, the restaurant is busy and the parking lot full, but valet parking is available, as is overflow parking in ‘Barbarie’s Plaza’ next door. Inside the restaurant are two main dining rooms and despite the number of people and the five televisions in the room my group is sat in, there is an appreciable lack of noise. The TV screens which play everything from sports to news have the sound turned down and the lack of background white noise makes for a refreshing change, in this increasingly noisy world. It’s always nice to be able to hear those sat at your table. In addition to the menu, and daily specials, there are off-menu items that have a habit of materializing at your table without charge, courtesy of Tommy. The Bruschetta (gratis) that we are served is a simple combination of crusty bread lightly grilled with garlic and olive oil, topped with fresh flavorsome tomatoes, and grated parmesan cheese. The tomatoes, which benefit from being in season, are simply delicious and this trusty 15th century Italian staple is a winner. Escargot and Prawn Cream Linguine ($15.95 for four) is a simple dish that is also off-menu. It combines exquisitely cooked escargot that have a soft and delicate consistency (and there is no overpowering flavor so fear not) with prawns, perfectly cooked linguine and an extremely light cream sauce. The linguine is served with generous helpings of garlic crostini which proved to be difficult to resist. Clams Casino ($9) is a self-proclaimed house favorite and it is easy to see why. 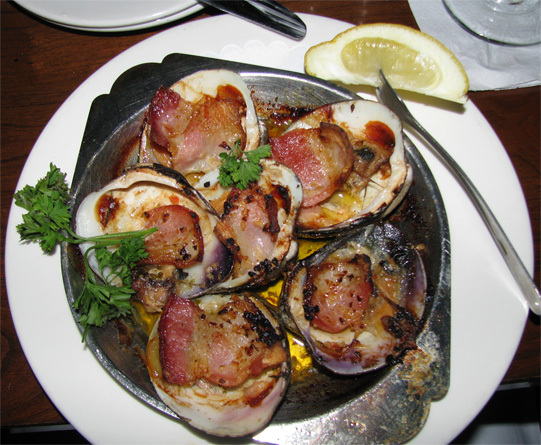 Littleneck clams topped with casino butter and crisp bacon make for a delicious appetizer. 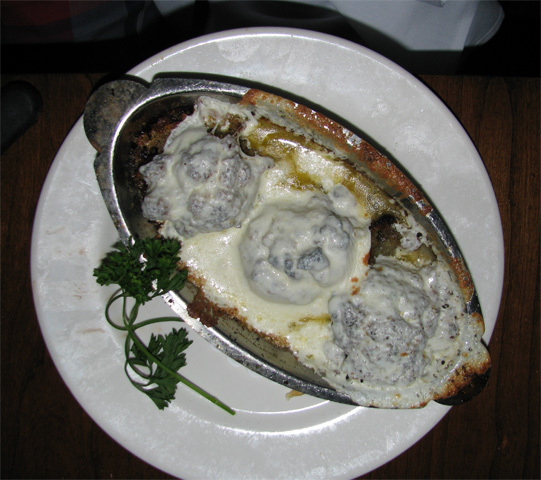 The Sausage Stuffed Mushrooms ($9) proved to be something of a surprise. The sausage was crumbly and appeared to have been breaded and the generous molten fresh mozzarella and garlic sauce, provided a breathtaking combination and was the highlight of the night. Every main course comes with a starter salad of mixed greens, cucumber, and shredded carrot. They were very fresh (no wilting or browned tipped leaves here) and are served with homemade salad dressings. Consider the off-menu Parmesan Peppercorn dressing which while creamy was extremely light and full of flavor. All the main courses are served with your choice of baked potato, mashed potato, fries or rice and the vegetables of the day. The French beans and carrots served were just the right side of al dente. 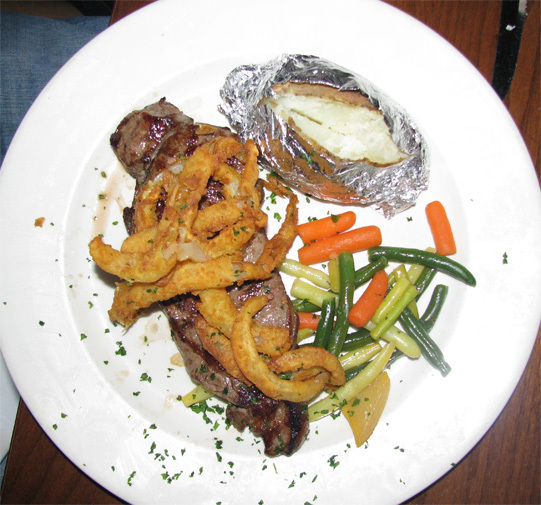 The 12oz Black Angus New York Strip ($24) which was cooked medium was moist, full of flavor and the large serving size was sufficient to satisfy even the most ravenous of appetites. The Maryland Soft Shelled Crab ($23) was a daily special and two large soft shelled crabs had been lightly floured before being sautéed with fresh shallots and garlic in a zesty chardonnay wine sauce and served over warm garlic crostini. This was another stand-out and was also available as an appetizer with one crab ($13). 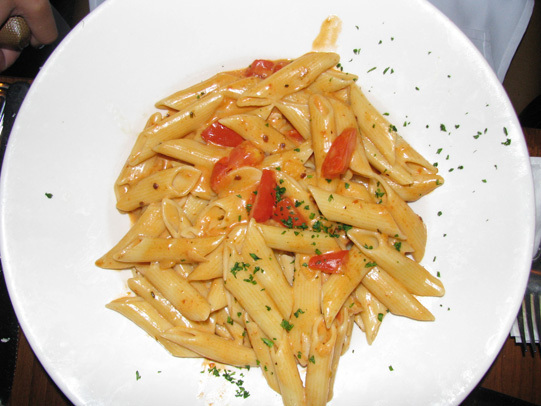 Penne a la Vodka ($12) was tossed penne in a garlic, fresh mozzarella and basil creamy pink vodka sauce. The serving size was extremely generous and provided lunch for the following day. 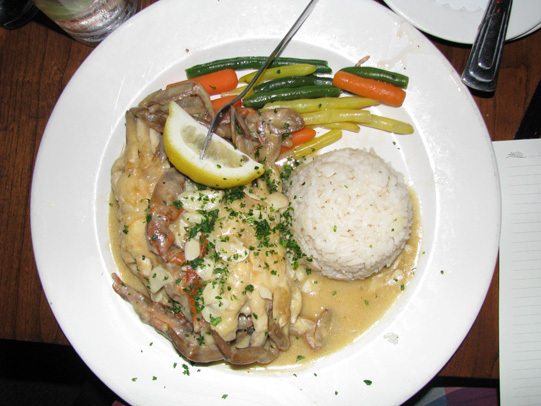 Again the sauce was perfect, neither heavy or cloying it which is all too often rare in a cream sauce. The penne can also be ordered with grilled chicken ($4) or shrimp ($7). 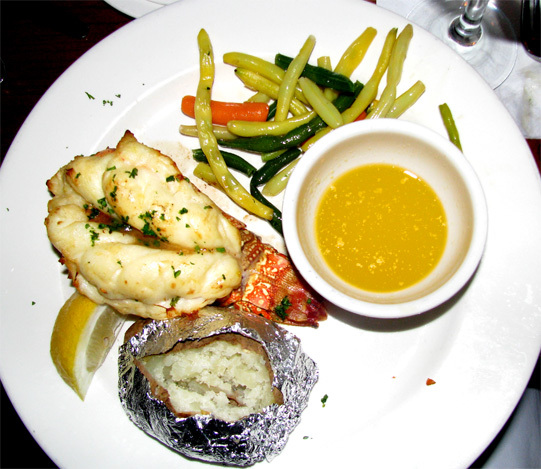 The 7oz Brazilian Lobster Tail ($35) was steamed and served butterfly style, so the tail puffs out of the shell, removing the hard work often associated with eating lobster. It was cooked to perfection. Jim Barbarie’s offers a full range of desserts from ice cream ($4) to crème brulée ($6.50). Particularly noteworthy was the homemade tiramisu ($5.50). Lady fingers are soaked in Kahlua and espresso, layered with a combination of mascarpone cheese, whipped cream and sugar. The chocolate sauce that lightly drizzles the top is an unusual but welcome touch. 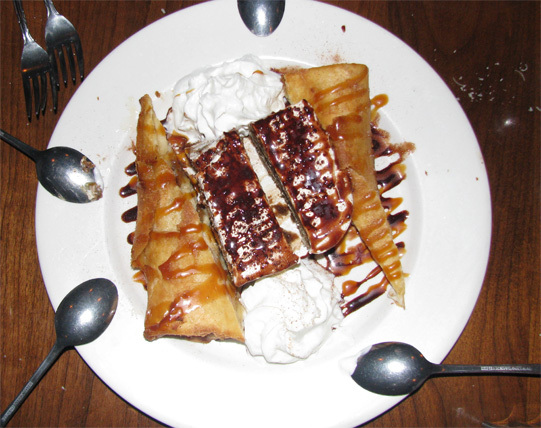 Fried Banana Cheesecake ($5.50) is a decadent delight. A parcel of filo pastry is filled with cheesecake topping and banana. Flash fried, the resulting dessert , is an exquisite combination of flavors and textures. A full take out menu is also available at this Danbury institution.